"Who Cooks for Poor Sam Peabody?" Recognizing bird songs is a skill, and it's fun to learn how to do it. A birder who knows the songs almost always see more birds with the ears than with the eyes, because we can hear around corners and through foliage. We can hear on the darkest night. We can even hear birds outside while lying in bed. 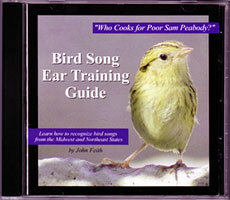 This audio CD makes it easy to learn the songs of the birds most often encountered in the Midwest and Eastern USA. You hear each bird song, followed by a short description. We remember things best when we have something to hang the memory on, so the CD gives a mnemonic for each song. After you hear the song and the mnemonic, then you hear the bird's name. That gives you a chance to try to guess the name yourself, or to test yourself. Such active listening helps you learn the songs quickly and easily, because it engages the memory process. One way to use the CD is to enable the "Random Play" or "Shuffle" option on a CD player, portable stereo, or personal computer. You will find your song recongnition skills improving rapidly.